Go over present and estimated tuition charges for Cal State San Marcos, as well as just how these costs contrast to nationwide and regional averages. Get a full knowledge of the fees and tuition related to California State University - San Marcos in order to prepare successfully for 4-6 years. Look at the data here to understand how California State University - San Marcos' price compares to other colleges and universities and if you need to plan for tuition increases. How Does California State University - San Marcos Compare to Other Colleges? For nationwide, regional and statewide comparisons, check out the following table to find out how Cal State San Marcos compares to other colleges. The cost of tuition and fees at Cal State San Marcos is dramatically reduced for students from California. Tuition and fees for in-state students is set at $7,653 for the 2017 - 2018 year, a 60.8% discount off the full price. Tuition is $5,742 and fees $1,911. Cal State San Marcos tuition and fees for out-of-state undergrads is $19,533 for the 2017 - 2018 school year. Of this total, $17,622 was the cost of tuition and $1,911 the cost of fees. The subsequent table shows the expenses explained above for the 2017 - 2018 school year. How much does Cal State San Marcos cost per credit hour? For more information, visit Cal State San Marcos Part Time Tuition & Fees. 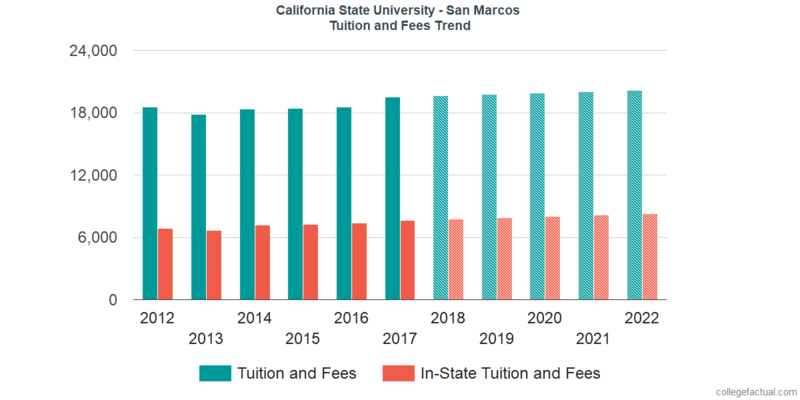 California State University - San Marcos tuition and fees for out-of-state students increased at a typical yearly rate of 0.6% within the last five years. Over that same period, tuition increased by 0.0% and fees increased by 5.9%. Based on this, we predict the price of tuition and fees this year will be $19,654. At this rate, we estimate the total cost of tuition and fees for a two year degree to be $39,430 and $79,351 for a four-year degree. Remember, this doesn't cover other charges such as room and board, books, and transportation. The next chart displays estimated upcoming tuition and fees including residence based reductions for undergraduate students at Cal State San Marcos. Be aware of just how much the tuition and fees are growing each year. At most colleges undergrads will wind up paying a greater price for their last year of school than they did for their first. Get your financial college questions clarified in our tuition & fees FAQ.